I'm writing a new series based in Texas and I've been studying maps. 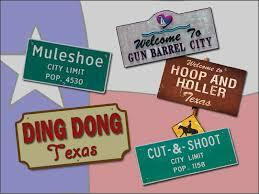 Texas sure does have some odd, charming and altogether weird or funny town names. Here's just a couple that caught my eye. Believe it or not, this town name was the result of a church fight. No one really knows what the dispute was about. Some say it was over the new steeple; others say there was a disagreement as to who should preach there. Still others insist it was over church member land claims. Whatever the reason, the meeting at the church turned violent. Later, after the matter was taken to court, the judge asked a witness where the confrontation had taken place. Since the town didn't have a name the witness described the location the best way he knew how. “I suppose you could call it the place where they had the cutting and shooting scrape,” he said, and the name stuck. As the saying goes, if you find yourself in Ding Dong, you had to be looking for it. Two early residents Zulis Bell and his nephew Berth ran a general store and hired a local painter named C.C. Hoover to make a sign for their business. Hoover illustrated the sign with two bells inscribed with the Bells’ names, and then wrote “Ding Dong” coming out the bottom of the bells. No one remembered the Bells but they sure did remember Ding Dong and the name stuck. This is a small unincorporated community in Delta County.The town's name comes from the name of a fictional store in the Lum and Abner radio show from the 30s and 40s. The name originated from the practice of leaving a dime in the box at Brown's Mill to have a letter delivered. The practice stopped when a post office was opened in 1877. 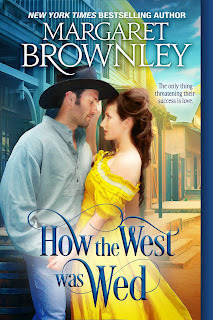 The following town isn't in Texas, but I just love the name—and of course the love story. Total Wreck was discovered by John L. Dillon in 1879.He named it such because he thought the ledge the mine was on looked like a total wreck. A man once got into a shooting at Total Wreck and survived because the bullet lodged in a stack of love letters he had in his jacket. He later married the girl who wrote the letters! Haywire is the name I chose for my fictional town in Cowboy Charm School (Coming September 2018). You'll have to read the book to find out how the town got its name. What town have you visited that had the strangest name? (and I have no idea how it got its name). More shenanigans in the town of Two-Time, Texas! Texas is not alone with odd names. Illinois has a small town called Bone Gap and another Dog Leg. Have no idea how either got it's name. Interesting names. It just makes you want to check them out. Thank you for sharing. Oklahoma has quite a few towns with odd names: Slapout, Slaughterville, Frogtown, Cookietown. And then there are the towns with Indian names: Tahlequah, Wetumka, Pawhuska, Bochito. Fun post! 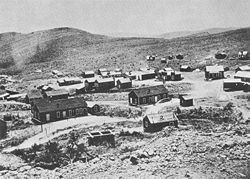 Can you imagine living in a town named Slaughterville? Cookietown sounds fattening. I wouldn't even know how to say the Indian names, let alone spell them. Thank you for sharing! This was a really fun post. I can't think of odd names, but Maine has Poland, Denmark, Mexico, China, Norway, Paris, Sweden, Naples,and Peru! There is a sign that's sort of a landmark that lists all these names with arrows pointing which direction to go! Hi Connie, I can't imagine the confusion that must arise when somebody claims to live in Denmark or Paris. It sounds like the towns were named after a lot of homesick settlers! My husband searched the Internet because I was discussing this with him and he found there is another signpost here in a town called Friendship, Maine for Freedom, Liberty, Harmony, Unity, Union and Hope! And they really are all towns! I had some nice laughs with the names of town. Illinois does have some odd names too like Cooks Mills, Gilmore. It's interesting how names come about as Illinois has the only Oblong in the US. Hi Marilyn, I wonder if Oblong describes the shape of the town or is the name of a person. Margaret, what a fun post! Some of those names are rather funny. Thanks for sharing a bit of the way they arrived at their names. Accident, Funckstown, Indian Head, Chevy Chase (not the actor), Fruitland, Friendsville, Pittsville, Port Tobacco, Secretary, Deer Park, Crapo, Boring, Hancock, Seat Pleasant and Savage.